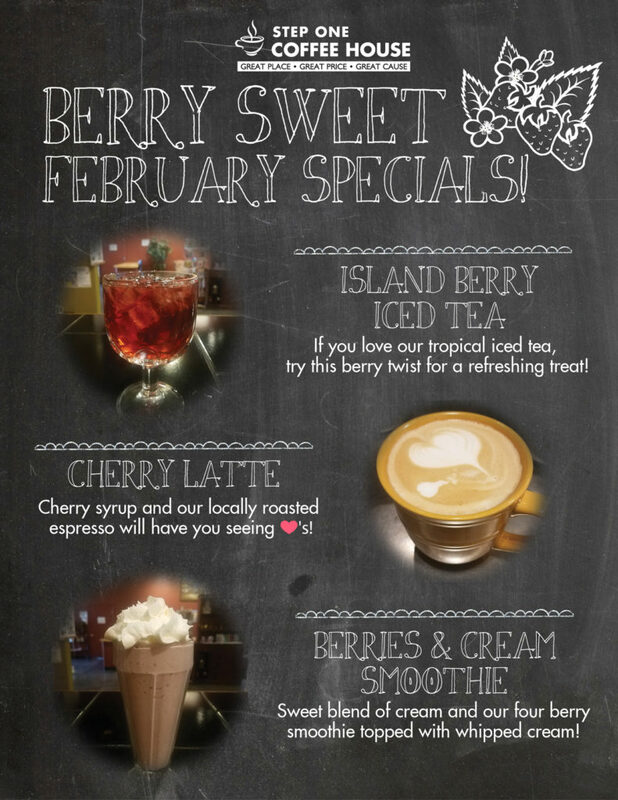 If February doesn’t have you seeing hearts, stop by Step One Coffee House in Prescott Valley and check out our three new “berry” sweet drink specials — we think they will ignite those feelings of love! If you like our Tropical Iced Tea, try our new Island Berry Iced Tea for a sweet twist! For a cool treat, pick up the Berries & Cream Smoothie – a touch of cream blended with our four berry smoothie mix (and topped with whipped cream). And finally for the coffee lovers, check out our new Cherry Latte! Looking for something different? Check out our website and look at our coffee house menu, or stop by and talk to our baristas about your favorite flavors! Step One Coffee House – 6719 E. 2nd Street in Prescott Valley. Phone: 928.759.3770. Open Mon – Sat 7 am – 2 pm.